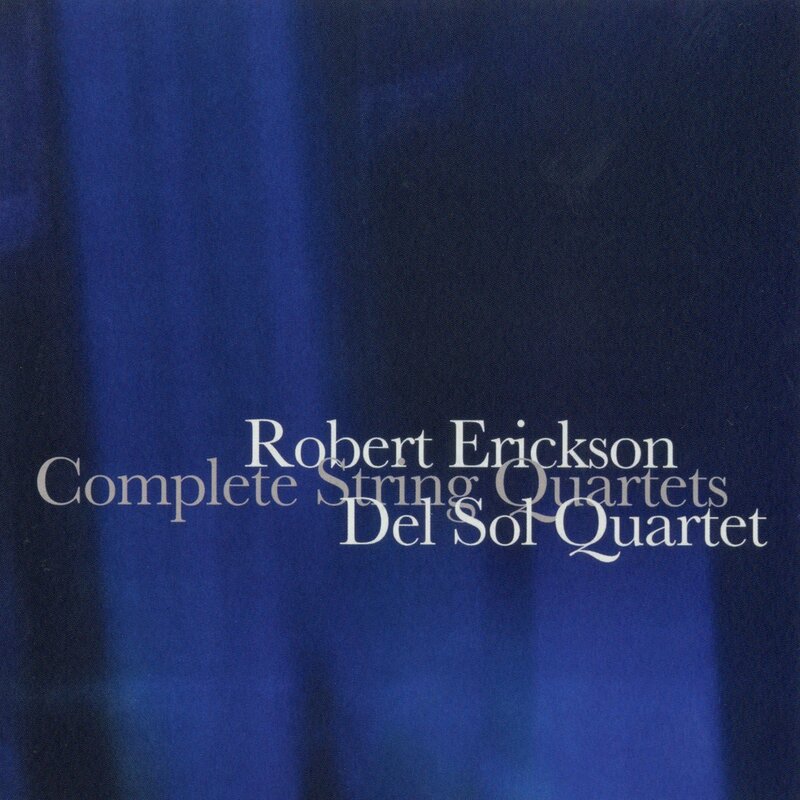 This two-CD set collects all four string quartets by American composer Robert Erickson (1917-1997). A significant composer in his own right, Erickson’s influence is probably mostly felt indirectly, through the work of the composers and performers he taught in his long academic career. Although born in the Midwest, Erickson was associated with the West Coast and particularly with the San Francisco Bay area, where before moving to the University of California at San Diego he spent a significant part of his professional life teaching. While there he taught at UC Berkeley and the San Francisco Conservatory, where he mentored such rising avant garde figures as Pauline Oliveros, Loren Rush, Terry Riley and Stuart Dempster. Erickson encouraged their interest in improvisation, which he integrated into his teaching, worked with them and others in the pioneering experiments undertaken at the San Francisco Tape Music Center and more generally through his role as music director of Berkeley’s Pacifica radio station KPFA, helped foster the renaissance of sound art in the Bay Area in the 1960s. Erickson’s early composition studies were with Ernst Krenek, and it is possible to hear some of Krenek’s influence in the first two string quartets. The first, from 1950, is a relatively brief, atonal work with a more or less conventional three-movement structure. The first movement carries an underlying motif marked by a rhythmic continuity that holds through a variety of melodic transformations, while the second, slow movement features legato lines of a flowing expressiveness. The final movement is brisk and fugue-like, with lines made of complementary rhythms. String Quartet No. 2 (1956) is a considerably longer, one-movement work that, while freer in structure than the first, is also rooted in twelve-tone counterpoint. Unlike much of the serial composition of the time, the second quartet manages its dynamic variations through gradations rather than through abrupt shifts, and intersperses expressive soliloquies throughout. Three decades separate String Quartet No. 2 from the final two quartets—Solstice (1984-85) and Corfu (1986). Just as the first two quartets resemble each other in their general features, so too do the final two have common overall characteristics. Both are single movement works centered on C in which the atonal countrapuntal writing of the first two quartets has given way to an emphasis on harmonic centers and expressive, largely consonant melodies. Solstice announces its tonal underpinnings right off with notes doubled in unison or at the octave, an arrangement that recurs intermittently throughout the work. The predominant flavor of the quartet is pentatonic, but with notes altered and supplemented often enough to give a polymodal feel. The sparser, more reflective Corfu is a serenely paced work drawing on a tonal vocabulary similar to that of Solstice, but relying on single voices spinning introspective melodies to create a nuanced yet powerful expressive impact. Both pieces exploit the subtle timbral effects of doubling notes across octaves to brighten the ensemble texture, with Corfu pushing this effect even farther with frequent use of harmonics. This is a highly welcome set of music from a too-little known composer, with excellent performances by the Del Sol Quartet.